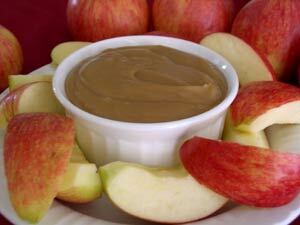 Kip LOVES caramel dip for his apples. And of course Kade is a "dipper" too! I found this recipe on Cooks.com the other day, so I tried it out. So easy and YUMMY! Cook butter, sugar, corn syrup, water and milk until all the sugar is dissolved over medium heat, stirring constantly. Remove from heat and add vanilla. The caramel sauce will keep in the refrigerator for 4 to 6 weeks. To serve, heat caramel sauce and pour into chafing dish. It is divine served warm over ice cream or pound cake.